We should send chemistry graduates to poetry slams, physicists to literary festivals, while the non-scientists should be welcomed on to lab benches until we all learn to speak the same language and appreciate what each other does. 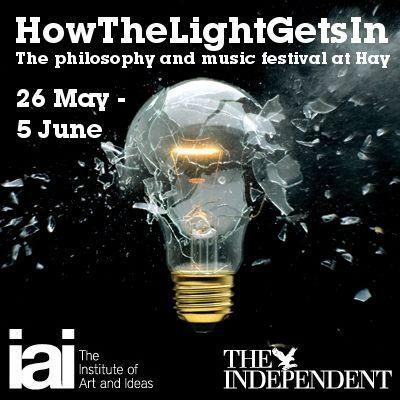 I am not precisely following this admonition, but nevertheless I have accepted – with some trepidation – an invitation to participate at one of the Hay festivals; not the well-known literary festival but the more recently initiated philosophy one known as HowTheLightgetsIn which runs in parallel. Professors aren’t without their own weak spots and it’s never too late to improve one’s skillbase. Mary Warnock, John Harris, Athene Donald, Aubrey de Grey. Bryan Appleyard chairs. Scientists now claim a brave new world of designer humans is on our doorstep. Is this an illusion, a disaster, or a great opportunity to reinvent what it means to be human? Life extension proponent Aubrey de Grey and philosopher John Harris take on bioethicist Mary Warnock and Cambridge physicist Athene Donald. Right, I thought, I had better get to grips with the other side. So I spent much of Easter reading John Harris’ book Enhancing Evolution, the Ethical Case for Making Better People. Harris is a philosopher, currently a professor of Bioethics at Manchester (in the Law Faculty). I have not made a habit of reading books by philosophers and I cannot tell whether my reaction to this book is specific or general. As a scientist, weighing up evidence, let me just say I did not find it convincing. I should probably save my detailed views for the debate itself but, suffice it to say, much of it seemed to me to be a case of Harris making assertions and assumptions which he thought were so self-evident as needing no discussion and then trouncing other people’s views who had perhaps done the same thing. He is clearly very sure of his own position. I am quite prepared to believe my reaction to this is because I am missing something crucial that underlies the way he writes, but I’ll give an example by way of illustration. No music lover would be satisfied with getting from a pill the pleasure of listening to Mozart without ever hearing the music. Most people want both to feel good and to feel good about themselves, but only as a result of being good and doing good. Kass is right, but not because he or the music lover to whom he appeals are fastidious. You cannot get music from a pill because a pill does not make a sound, even in the brain. I find this rebuttal completely unsatisfactory because so much of what Harris talks about is equally implausible. We do not currently have a prevent-all vaccine for cancers – to which he frequently alludes as if it will happen – so why does he rule out a pill which makes us hear Mozart in the brain as not going to happen but asserts the things he wants to believe in as certainties? I am nervous that I am completely missing the points Harris wants to make (impostor syndrome rears its ugly head again), but I will discover this publicly at the end of May! I do at least have a clear idea of my position, and I hope I can inject some rational science into the discussion in as well as my own more personal views about the desirability and plausibility of some of the proposals Harris puts forward. Athene Donald, Dylan Evans, Jayney Goddard, Steve Fuller. Rachel Armstrong chairs. Even though the successes of western medicine are loudly applauded, alternatives from aromatherapy to raki, acupuncture to crystal healing, balloon in popularity. Is this evidence that the western model of health is flawed? Could any of these alternatives offer a genuinely new paradigm or are we seeing human gullibility at work? Homeopath Jayney Goddard and iconoclastic sociologist Steve Fuller face up to Cambridge biophysicist Athene Donald and author of Placebo: The Belief Effect Dylan Evans. I’ve only just started on my crash course of reading for this one yet…..but I do have a clear notion of where I stand. Having said that, it is a fact that I have carried out some research vaguely relevant to acupuncture (even if ultimately my motivation was to try to stop my international collaborators invoking a ‘vital force’ that I thought was no more than Brownian motion) and I don’t rule all alternative medicine out, just some of the obvious things such as homeopathy. The laureate for the Women in Science awards, Dame Athene Donald, talks about the dangers of prejudice, overcoming gender stereotypes and how women are vital for the sciences. So you can see that the Chinese whispers continues. I – and not just my alleged treatments for Alzheimer’s Disease – have become ‘revolutionary’. Oh dear. Maybe see some of you in Hay? This entry was posted in Communicating Science, Interdisciplinary Science and tagged alternative medicine, Hay Festival, Human enhancement, John Harris, Mary Warnock. Bookmark the permalink. Wow, that´s quite a set of engagements. I admire your courage! Is that all on the same day or will you have time to recover. I´ve never been to Hay but it does sound like an amazing series of events. Can I be the first to say ‘Congratulations’ here?